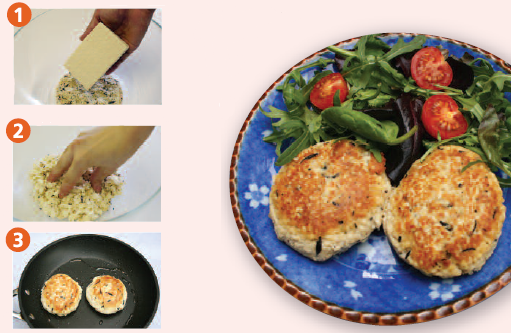 Make healthy Tofu “Hamburgers” by simply mixing with tofu and frying! Enjoy the silky smooth texture of tofu together with the crunchiness of vegetables with these Japanese style hamburgers that use no meat at all. Tofu is a processed food product made from soya beans. It has been eaten in Japan and all around East and South East Asia for generations. Tofu is made by softening soya beans in water and then crushing them into a paste before boiling the paste down into soya milk. This is then strained through a cloth and a thickening agent known as “nigari” is added before being left to set. Tofu contains generous amounts of plant protein, making it very nutritious. It also has comparatively few calories and in recent years has become popular around Europe and America as health food. 1. Wrap the half pack of tofu (around 150g) in a kitchen towel and heat in a microwave (600W) for around one minute to remove the water. Pour a whole packet of the hamburger mix (15.4g) into a bowl and add the tofu. 2. Knead the mix and the tofu together until it has an even texture and then divide it into two to four individual burgers. Shape these into flat patties. 3. Heat some vegetable oil in a frying pan and place the patties in to cook. Cover the pan with a lid and fry for three minutes on a medium heat. When the patties turn brown flip them over, replace the lid and fry for another two to three minutes.